Chris Cleave’s latest novel is a beautifully written story of love and war. It is very loosely based on his grandparents’ experiences during World War Two. You can find photos of them on his website and some personal letters which, for me, added an extra dimension of reality to the book. http://chriscleave.com/ It is this sense of real people in a real conflict that made this an engrossing read for me. 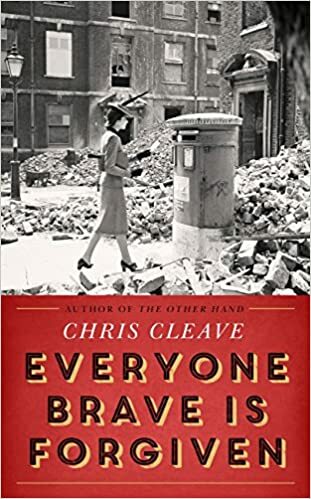 Everyone Brave is Forgiven tells the story of Mary, Tom and Alistair and how they experience World War Two. Mary signs up as soon as war is declared with visions of being a spy. Instead, rather to her disappointment, she is instructed to become a teacher. Tom and Alistair are friends who share a garret flat until Alistair volunteers for service. Tom and Mary meet when she is appointed to teach the children who have been left behind after the evacuation of London or returned when, heartbreakingly, no-one will have them. Some of the children have mental or physical disabilities and some, like Zachary, are black. In Mary North, Chris Cleave has created a wonderful character. She was feisty and determined and I loved how much she cared for the children in her class even though they were dismissed by others as not worth teaching. Her belief was “..what good is it to teach a child to count, if you don’t show him he counts for something?”. Her views sharply contrasted with the attitudes of a society where racism, social inequality and unwillingness to accept differences seemed to be the norm. Her relationship with young Zachary throughout the story was especially touching. The setting of wartime London was particularly well captured. The descriptions of a city destroyed and the sheer exhaustion of the people were so atmospheric. I kept getting the sense that this is how it really was for people during the war. Everyone experienced it in their own individual ways. Everyone dealt with their losses and coped with the atrocities they saw in their own different ways. Everyone had their own way of getting through the days and nights. I kept thinking about the characters when I wasn’t reading especially Mary and her pupils. Chris Cleave doesn’t shy away from having surprising and shocking things happen to his characters. I have really only spoken of Mary here but of course Tom and Alistair have their own stories too. Alistair’s time in devastated Malta is vividly described where, despite the incredibly difficult circumstances, there was a lot of humour brought into the story. I suppose that is one of the ways those serving could deal with the situation, by joking about it. Alistair’s friendship with his fellow officer Simonson was poignantly expressed. And if that isn’t enough, there is a powerful love story woven throughout the story. Everyone Brave is Forgiven is a quietly brilliant and honest look at war. A convincing story with memorable characters, this emotionally compelling book is a must read. When war is declared, Mary North leaves finishing school unfinished, goes straight to the War Office, and signs up. Tom Shaw decides to give it a miss – until his flatmate Alistair unexpectedly enlists, and the conflict can no longer be avoided. Young, bright and brave, Mary is certain she’d be a marvellous spy. When she is – bewilderingly – made a teacher, she instead finds herself defying prejudice to protect the children her country would rather forget. Tom, meanwhile, finds that he will do anything for Mary. Wonderful review Joanne and I’m adding this to my TBR right away. It’s a terrific read Linda, sure you’ll enjoy it. It’s very good Clair, hope you enjoy too.